The yellow color of this rod will match many yellow polyethylene applications, like Suzuki dirt bikes and Suzuki ATV's, where you need a more invisible repair.Polyethylene is used in some underhood areas such as windshield washer bottles and radiator overflow tanks. In non-automotive applications, it is used on ATV fenders, dirt bike fenders and gas tanks, motor home water tanks, kayaks, canoes, and agricultural water/fertilizer tanks. Because Polyethylene is very stable (meaning few things will react with it), it is almost impossible to get quality repairs using adhesives, and also why it is used to contain chemicals (gasoline, pesticides, etc.) that would react with other plastics. 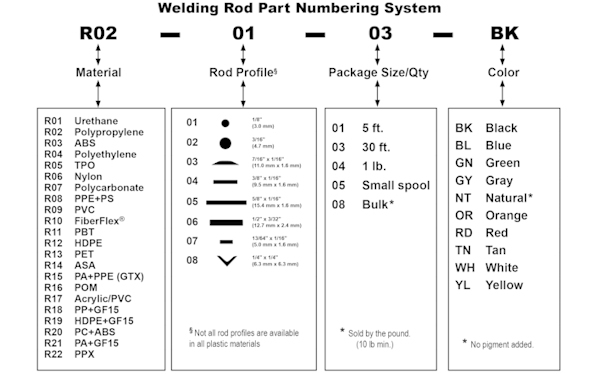 Welding is the best repair method for polyethylene.The YELLOW color of this rod will match many YELLOW polyethylene applications where you need a more invisible repair. 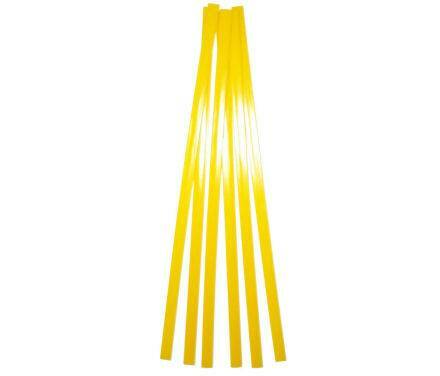 This package contains 5 ft. (1.5 m) of YELLOW polyethylene strips. These polyethylene strips are 12 inches (30 cm) long. They are approximately 3/32 inch (2.38125 mm) thick and 13/32 inch (10.31875 mm) wide.